Shona’s top tip for aspiring authors: Read your genre to see what is currently selling, but also read widely. Be a magpie and learn from other genres. 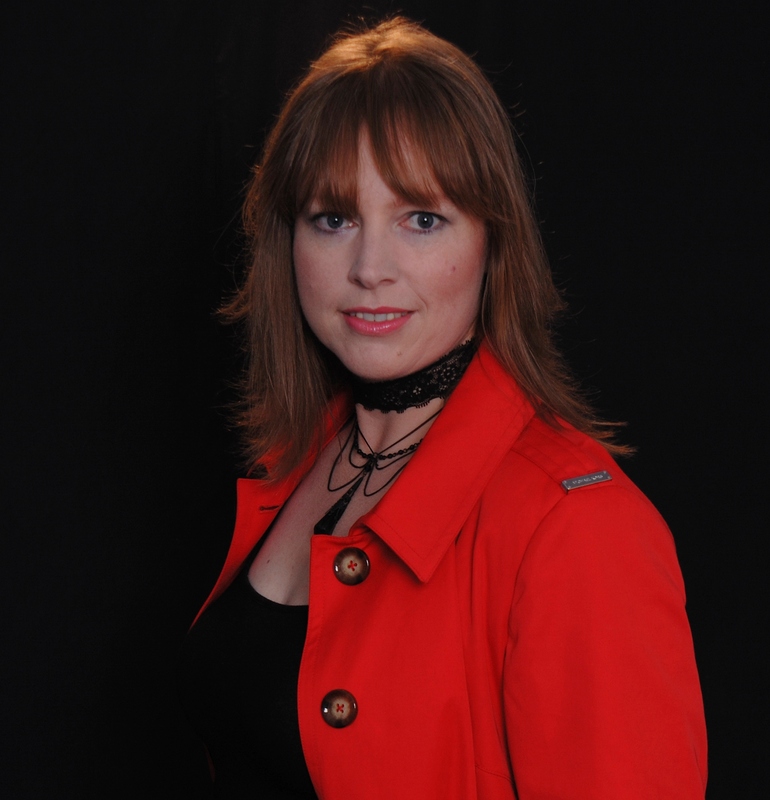 Shona Husk is the author of more than 40 books that range from sensual to scorching, and cover the contemporary, paranormal, fantasy and sci-fi romance genres. 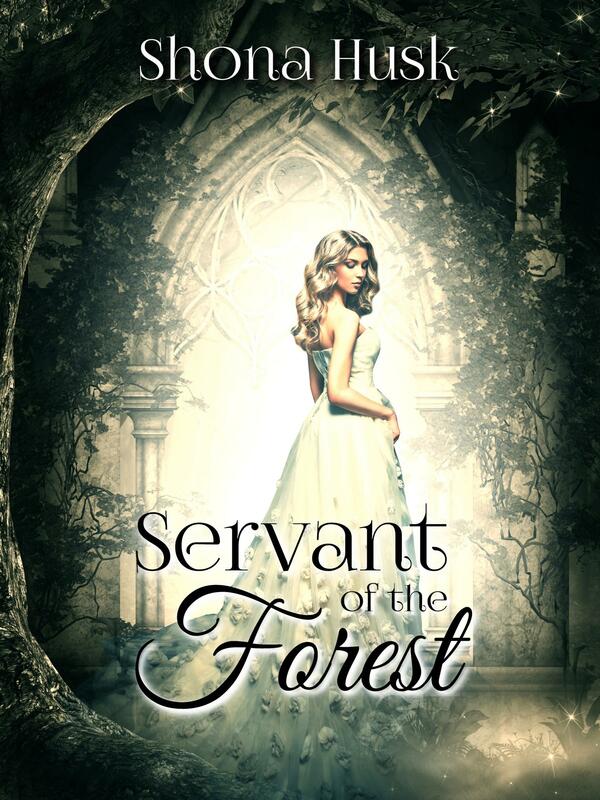 Her most recent series are Face the Music, Blood and Silver and Annwyn. As well as writing romance she also writes sci-fi for the Takamo Universe game and urban fantasy under anther pen name. I’ve always made up stories. They used to be just to entertain myself, but while I was on maternity leave I started writing them down. It was about three years before I got serious about wanting to be published. Even now I write the stories I’m interested in and that I want to read—I have to because I spend so long working on them. I’d probably still be a civil designer (designing roads, drainage and sewerage infill etc), and I’d probably have more free time for my other hobbies like cross stitch. However, I’d still be a reader and I’d still be making up stories to entertain myself. When I started writing it was time (I had babies) and a lack of knowledge. It was taking me 12-18 months to write a novel and I couldn’t learn about story arc and character development when it was taking so long. I switched to writing novellas (I was already reading novellas because I didn’t have the time for novels) and it all came together. The next novel I wrote then sold (the other two live in a cupboard). How involved have you been in the development of your books? Do you have input into the cover/illustrations? I fill out a cover art form then the publishers take over. Edits are always a negotiation, but most of the time I agree, or I look to see what they are trying to achieve and find a way to do it if I don’t agree with their suggestion. Everyone is trying to make the best book they can. For my self-published books I generally get a premade cover. I have a few sites that I search and I find something suitable that conveys the mood and genre of the book. What’s the best aspect of your writing life? I love plotting and researching. Creating the characters and their world is so much fun. The final page proofs. By the time I get them I’m sick of the book, yet at the same time it is the last chance to catch mistakes so there is pressure involved. I would pick a sub-genre and stick with it. While I write romance I write in several sub-genres (contemporary, paranormal, sci fi and fantasy). For branding I think sticking with one sub-genre would’ve been more effective. Getting published isn’t the hardest part nor is it the end. Staying published and marketing are hard work. Stories are all about conflict and the conflict has to keep escalating. Then an invitation arrives. The King is throwing a three-day party for the Prince, a last attempt to find a cure for the curse that will claim him on his twentieth birthday. The witch who saves Gauthier will get his hand in marriage and will eventually become queen. Aśka’s top tip for aspiring illustrators: People say that a lot of it is luck. That is true. But luck is a statistical concept. If you want to play the numbers game you have to be in it! So make sure you enter all the competitions, challenge yourself with unusual illustration projects, join groups, try to apply for grants and send your folio out to all the publishers every year. If you buy 100 tickets in a lottery, your “luck” is sure to improve. And so will you. Aśka is an illustrator, artist and scientist. Once a PhD candidate researching quantum optics, she turned her hand back to art with the goal of being a children’s book illustrator. She has more than 10 years of experience in children’s character illustration and book development, kids’ product design, graphic novels, animation, design and children’s science education. 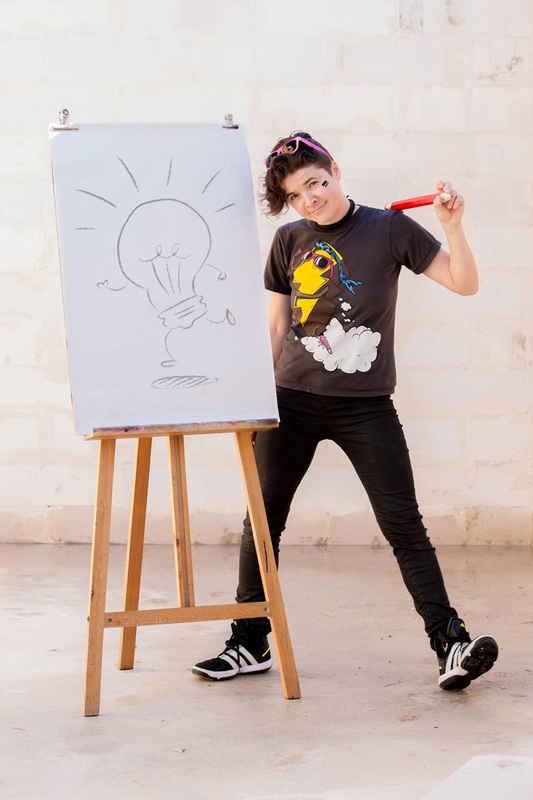 Aśka has had numerous comics published in Perth and Melbourne, was featured on an ABC TV documentary – Noise On Screen – , won a Curtin Gallery Grant for her solo art exhibition, and ran an eight-week animation festival on the Northbridge Piazza Superscreen. Continuing her passion for science, she also works for Scitech, presenting science programs and workshops to children across Western Australia. 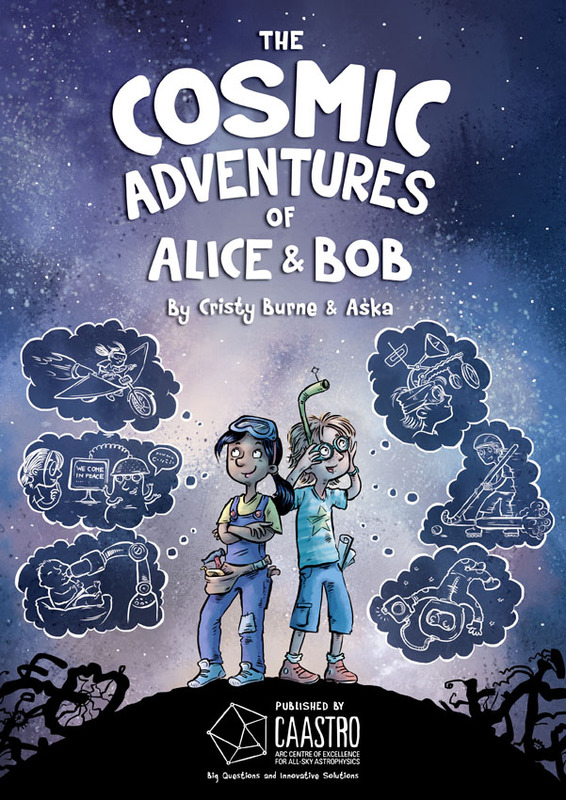 Three of her illustrative projects have been published in 2017: The Cosmic Adventures of Alice and Bob, by Cristy Burne (CAASTRO); Pepsi the Problem Puppy, by Sandi Parsons (Faraway Nearby Ink); and Looking Up, by Sally Murphy (Fremantle Press). Through her illustrations, she loves to create energetic characters with a curious streak – the best type of friend to take on an adventure uncovering the wonderfully diverse and inspiring world around us. What’s the best aspect of your artistic life? First of all it’s the act of creating new things that brings me a lot of satisfaction and personal fulfilment. I also love the flexibility of being my own boss, and the ability to really maximise my schedule on my own terms. I think I’m getting pretty good at that. I’ve always loved sitting in my room and making things. Back when I was in primary school my projects had an imaginary audience, and I developed comic books, board games, toys and teaching aids for them. Today I still sit in my creative bubble at my desk, but now I’m working towards more focused outcomes and (hopefully) for a real audience! It is easy to get lost in my work, and forget that sunshine and fresh air exist. In order not to transform into a cave-dweller, I try to take my bike for a ride around the river in the mornings. Working at Scitech several days a week also helps, as it gets me out of the house and amongst the children. How do you approach an illustration project? It all starts with some kind of research. This could take the form of anything really: leafing through pages of books by a particular artist, watching cloud formations or browsing images of frogs on the Internet. Ideas then start popping into my head and I proceed to ‘try them out’ by scribbling. Eventually one of the ideas becomes more dominant and persistent. Though I am a mostly a digital illustrator, I always start a concept with pen on paper. It is never pretty – more of a gestural squiggle, allowing me to feel the composition and envisage very early on how the design will take up page space. But once I start working on the line work, first sketchy, then more refined, ideas do often develop further. I essentially think through drawing. Seeing images on the page breeds further ideas. I’m illustrating a picture book about a boy with dyslexia, which was written by a dyslexic author. Having been fortunate enough to win a DCA grant, I have taken the project from my ‘creative cave’ and out to schools, inviting students from Years 3 and 4 to hand write their own stories. I then either use these stories as background textures in the illustrations, or actually illustrate them as part of the main character’s world. Because the book aims to give children an insight into the world of a dyslexic person, I wanted to make sure it was very accessible to children with reading difficulties, so as to not alienate this crucial audience. So I held some consultation sessions with a variety of children who struggle with reading, to ensure the font choices, sizes and illustration layout did not make the book more difficult to read. I am also developing a short video to show the children who participated how their contributions shaped and changed the illustrations. It is a project and a half! But it has been very satisfying working with so much input from children and truly developing the book together. I did everything backwards, as I didn’t do my research. After coming up with an idea, I made a book and then tried to plug the finished product to publishers, not even following their submission guidelines because I was so excited about my project I thought they would be too. Seems a bit crazy now. Joining SCBWI, learning about the industry and seeing other people go through the publishing journey certainly paid off in the end. But I think the obstacles are there every time I want to be published again. There is a lot of wonderfully gifted competition out there and limited publishing spots. So I guess believing that there is a space for me amongst all this talent in this vibrant and joyful industry of children’s publishing is the perpetual challenge. The only other job I’d settle for is an astronaut. What do you wish you’d been told before you set out to become an illustrator? I found that ten years ago I was saying “I’m an illustrator” a lot more than actually doing the hard, uncomfortable and challenging work. I wish I had had someone point out to me that being comfortable and finding things easy is not the way up. “Don’t draw to be paid” (or, “make money in your spare time”). I started out working for a design and illustration company, but found very little energy remained after work for my own artistic pursuits, as I was working in the very area I wanted to develop in. It was hard to experiment and find my own style when people were paying me for particular outcomes. I did the same thing over and over, so that my rent was paid. When I started to work as a science communicator, interacting with children on a daily basis, I would return to my studio full of ideas and will to create. I do of course get paid for my drawings, but I don’t do them with the sole goal of being paid. Dedication, daring and discovery… Ever wanted to find the answer to BIG questions? Or dreamed of inventing the Next Big Thing? Meet the world’s next-generation telescopes, jump on board with Citizen Science, and tackle the big questions with CAASTRO: Australia’s keen team of all-sky astronomers. The book aims to inspire and excite young minds about science, experimenting and the wonders of the universe but most of all, encourage them to never give up on having a go. Alice and Bob’s fictional adventure is enhanced by the factual stories of discoveries, sometimes accidental, woven throughout the book as well as additional layers of information, find-this-object challenges and teacher resources to emphasise the importance of previous space research on our everyday lives. This book is not available for sale, however all primary and combined schools in Australia received a free copy of the book so it can be found in a library near you. I ignored him. After all, who did he think was writing this story? 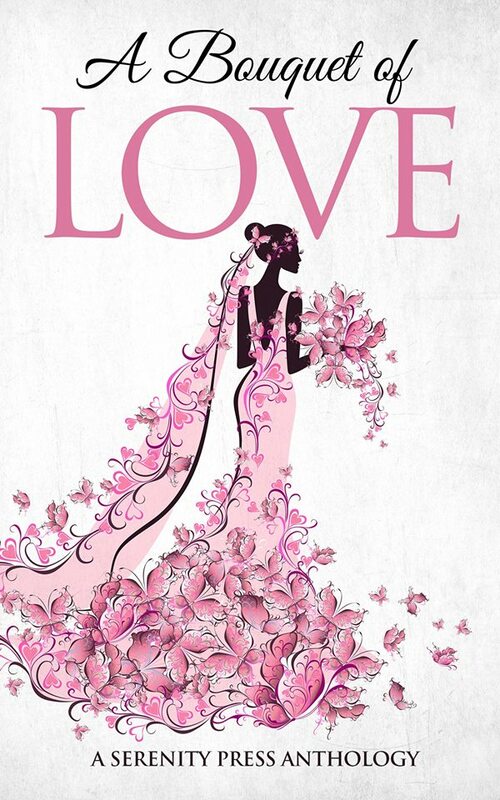 I didn’t plan on writing a light and fluffy romance for the Serenity Press romance anthology, A Bouquet of Love. My contribution to their previous anthology, Rocky Romance had been a light-hearted story about how a dog called Cat and a cat called Shakespeare brought together a gorgeous Irishman and a best-selling romance author who didn’t believe in true love and happy ever after. And while I’d had fun writing Perhaps Love, this time I’d decided to aim for reader tears instead of smiles. I wanted to touch hearts, not funny bones. What I had in mind was a moving story about a grieving brother choosing a wedding dress for his sister to wear in her coffin. I had a title – For Jasmine – and a love interest, because of course Matt would need someone to help him select the right wedding gown for the sister who’d been tragically killed with her fiancé in a road accident on their way to check out a reception venue. My characters, however, had other ideas. Then Dani – the love interest Matt encounters at Serendipity Bridal Boutique – took charge. ‘Sorry, you’ve got it wrong,’ she announced and rewrote my introduction in an entirely new style. I gave in and let my characters drive the story. They wanted to be heard, and I listened. I could have ignored their voices. I’m glad I didn’t. Grooming the Bride wasn’t the story I intended to write. Sometimes as authors we have to set aside our fixed ideas of what we want to write and let our characters take the lead. A different direction can be just what our story needs. The paperback is available here from Serenity Press. Buy the e-book from Amazon here. Authors! Share the Back Story behind your publications in this new series of posts. Email teenawriter@gmail.com for details.